It was a good day at the House of Windsor despite the weather conditions varying from deplorable to acceptable. The table was set with a close-fought, well played, Men’s 3RD Div. match between Westshore and CW. The win went to the Visitors, something like 41 – 33, with ALL of CW’s points being scored by Gus Boyd-Porter – believed to be a Ripley’s, Believe it or Not world record! Westshore was a well-balanced combination and although CW scored their share of tries it was not sufficient. Westshore Velox seem to take great esteem and deservedly so, in being BCRU Div 3 Champs. It will take a deal of good fortune and a quality performance to de-throne them. Thanks to the Bahamian ref, on loan for an educational visit by his Society, well done, particularly after two days full-on at Claremont’s H.S. Scrumfest. To the Islanders – good performance. This is a vital program for our club and it must be given greater support in the future. Massive shout out to The Don. Next up was the Premier contest against Rowers. This contest was only two minutes old when the CW scrum shunted Rowers backwards at the rate of knots. Captain Stewart drove hard off the back and it was two recycles later when Thornber crossed, 5 – 0. From here until the half it was a scoring parade based on a massively superior set scrummage; pace and good handling in an offence that clicked and nullifying pressure on defence. CW moved the ball left and right; open and blind; miss and delay to totally bedazzle the opposition. With the exception of Wilson-Ross, the resistance was limited. Other first half tries came from; Finnemore, Stewart, Herron, Hall, Thornber (for his brace) and Adibe for a 43 – 0 lead at the interval. The second half opened quite differently after the hosts had spewed the bench. Likewise, Rowers made some changes for their betterment. In fact, Rowers retained possession for some twelve minutes with consecutive phases and a man advantage but they made very little territory, a tribute to defensive patience. When they eventually entered the red zone they forfeited a penalty, breaking the back of any scoring likelihood. It was 25 min. before Bradley opened the scoring after getting the better of a tough one-on-one battle with Wilson-Ross. Kegode was next and Adibe closed it out with his brace, 60 – 0. For VRC, Wilson-Ross reminded us with of his Bay Days, feisty as ever however he was probably runner-up in his battle with Bradley. Dumas showed in patches and a couple of “nameless” second-half subs tried to make a difference. For CW, it was comprehensive most of the way. Ilnicki, deservedly earned the Hard Hat from his mates and this pundit thought Clay Burger was the M-o-M, dangerous with every touch, even if he did seagull on occasion but his work rate could not be knocked. Herron and Stewart were super visible; Hall orchestrated his outside men however his place-kicking was unusually awry and he must bring a sharper boot to next week’s fray. [Ed. Hope you enjoyed your steak dinner!] Josiah caused havoc with every touch and I liked the effort of Mailloux off the pines. And so it has come to pass, at Home Vs the Vikes. This promises to be a cracker. Keep an eye on this site during the week. Thanks to Latoya and her supporting duet for your work on an unpleasant day. The day’s showpiece was the women’s Premier contest. Seattle had possession for a good opening period but they were thwarted with tackles that in fact, drove them backward. When CW had their share with the ball, it came to Malone who backed herself, side-stepping wide for first blood at the ten minute mark, 5 – 0. The teams battled for another ten minutes at midfield before sure handling saw CW threaten. From a subsequent ruck, quick ball from Folk to Okonkwo who gave a ‘don’t –argue’ to a couple of attempted tacklers for her try after a 10m ramble, 12 – 0. 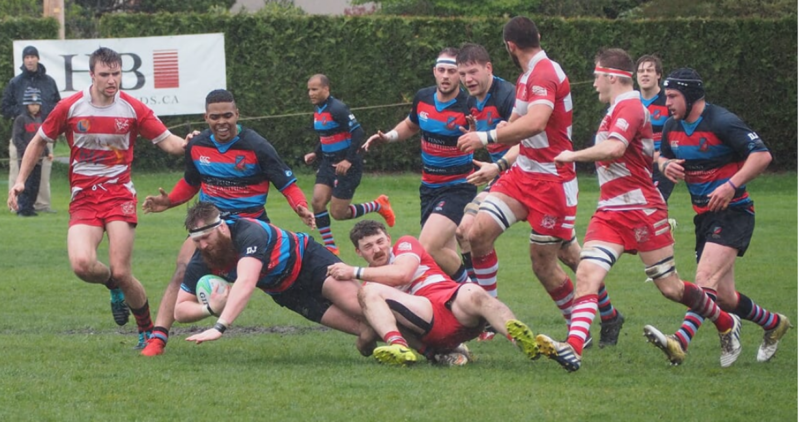 Seattle gained territory from the re-start only for CW to look to run out of danger but a “telegraphed pass” enabled the visitors to intercept for a 30m run and 12 – 7 score. The teams battled to gain superiority and it was CW’s Poulin who initiated a break; passes went inside, outside before Einarson crossed for a 17 – 7 half-time lead. The second half saw some serious testing by both sides, with CW’s stout defence being the difference. CW was first to get the score board rolling when Jess Hardy made a good break, on to Adams and a hard line from Appleby proved to be unstoppable, 24 – 7. CW had their tails up and Sya Trafford was the recipient of a clever “basketball pass” over defenders, from Julia Folk and it was 29 – 7. Seattle responded with their second intercept try form another easily “telegraphed” transfer, 29 – 14. Danica Pedrick rounded matters out for the locals and a 34 – 14 final. I was corrected, post note-taking, that the Sarries added a penalty along the way, 39 – 17. Thanks to the game officials, Chloe Hill-Huse backing up for her hat-trick on the day. Seattle were worthy opposition doing their best to make a statement and the teams now sit tied in third spot with CW facing UBC at Windsor next Saturday. This will provide a motivating curtain-raiser. There was much to enjoy from The Tricolours with solid and sure tackling being the highlight. A few names stood out for this viewer; Trafford and Folk in the backs; Okonkwo, Lang and Edwards-Challenger in the forwards. I give my W-o-M to flanker, Nicole Shaver whose work rate was non-stop. Well done, all. Meanwhile in Singapore, Canada’s men gave matters their best and as always, with Sevens, the score line differences came from the slightest of errors or debatable rulings. A 33 – 10 win over Scotland was significant, particularly after the feisty Scots had defeated Fiji. A second win over Japan who had defeated Spain was lop-sided and finally the boys succumbed to France after leading 12 – 7 with a critical call not being seen our way. The breakdown in Sevens seems to be officiated with such variance that it is always hard to guess which way the penalty will be served. So five points out of the exercise leaves Canada in 12th spot and it just might be enough to not worry about relegation and let it all hang out in the last two tournaments. Conner Braid continues to lead the Impact Player chart and deservedly so – with the words of a faithful CW supporter; “Onward and upward, men.” And I say good ’onyas!